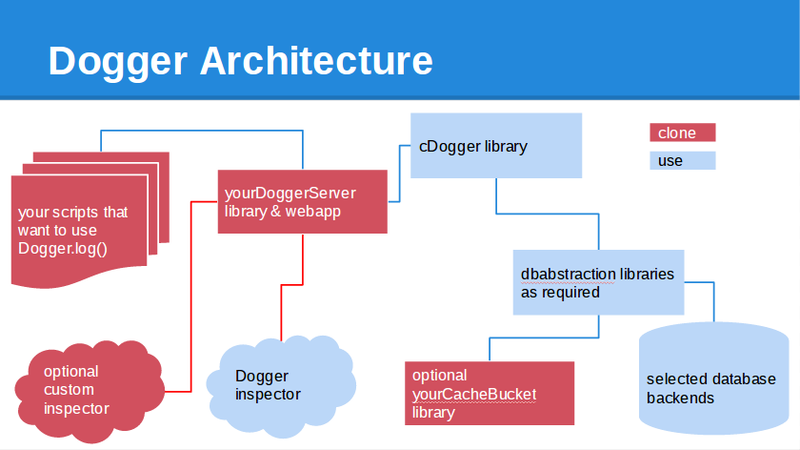 In Setting up your Apps Script Environment for Dogger I showed how to set up DriverScratch as a database to receive logging information from Multi user apps script logger. Since we are using Database abstraction with google apps script changing the backend to something else is simply changing a few parameters. As a reminder, here is the architecture. change the default handler information. Copy the yourDoggerServer script and replace the driver and tweak the profile credentials, using a spreadsheet ID and sheetname of your own. Change the library reference in your script from cDriverScratch to cDriverSheet (you'll find information on all known public libraries below) - and you are good to go. Here's a couple of small tests to try. Go to settings below and adapt as above.